'Wok, the magic dragon, lived in the big city. Kicking about in the autumn mist, in a land called Bruce Lee'. Yeah! No word of a lie! I saw Wok only the other day on Skype. He was in a meeting at the time with the Director: Godfrey Ho; and Actors: Bruce Thai, Dragon Lee, Bolo Yuen, and Bruce Lai. But then again it could have been in this film made in 1981, which lasted for about 90-minutes. Oh my wok! What a silly sod Sammy (Samuel Walls) truly is! All this shady-looking street-urchin had to do; was to give a pouch of diamonds to a bunch of thugs in the cover of darkness. But no. Sammy gets sucker-punched by these thugs instead. And worst still, his boss thinks that he's double-crossed him, because the diamonds are nowhere to be found. Well Buddha be praised! Who in Jackie Chan's name can help Sammy sort this mess out, huh? Micky (Nick Cheung Lik) and the Dragon perhaps? No. Not Dragon Yeung (Bruce Thai). This vest-wearing nut-job wants to do a spot of sightseeing first. Of course I'm referring to Dragon Hung (Bruce Lai). The yellow cat-suit wearing nut-job who has an estranged brother, with a face on him like a bull-dog chewing a wasp! Hey! Wait a minute! You do know the brother in question, don't you? Bruce Hung (Dragon Lee) is his name; and he's a right character he is. He can beat-up whoever he meets for no apparent reason what so ever. CRACK! Like gymnasts, POW! Loan-sharks, CRUNCH! And Monks, KA-PONG! Yeah. Without a shadow of a doubt Bruce is a regular Lee in the game of martial arts. Moreover, he doesn't get kidnapped by a gang of thugs either -- like Yeung and Mick's sister do. Still, that's most probably why what next transpires really kicks off when two rival gang bosses step up the pace. As kung-fu fly's solo - please get ready for Bolo - everybody let's have a fight - plus two estranged brothers try their best to eventually reunite. Now have you ever watched paint dry before? If not. Don't worry. Watch 'Enter Three Dragons' instead. You'd have a similar experience. Trust me, I'm a big martial-arts movie fan, and normally, low-production values, and bad dubbing, don't put me off this type of flick at all. However, there needs to be a story, right? Or at least a story you can follow in some capacity. Also, the dubbing in this piece just is so dire, it gives 'bad dubbing' a bad name. Hold on. I best stop myself there me thinks. I don't want to start off my review by bashing this film to smithereens, do I? Let me take a bit of a break with some filmic facts first. (1) Apart from its given name, this movie has been christened with five other names by default. In Hong Kong it's been called 'The Lama Avengers' and 'The Three Avengers'. In France it's been called 'Le Roi de Shaolin' and 'Le Défi du Ninja'. Plus internationally it has been called 'The Dragon on Fire'. (2) Not only is Dragon Lee very proficient in Hapkido and Taekwondo, but currently he is a television actor and producer in Seoul, South Korea. (3) Bruce Lai's alternate name is 'Yi Tao Chang'; and has been known to appear in films solely directed by the director of this adventure, Godfrey Ho. (4) Bruce Lee's former pupil, Bolo Yuen, first met his teacher whilst the two of them were filming a 'Winston' cigarette commercial together. (5) Believe it or not, Samuel Walls was the English producer on this film. God only knows why though. (6) Dragon Lee's real name is 'Moon Kyoung-seok', and he was born in South Korea, before moving to Russia and given the name, 'Vyachaslev Yaksysnyi'. (7) The 'Ed Wood' of Hong Kong Cinema, Godfrey Ho, has directed another movie in the same vein as this one, but a bit better -- 'Revenge of The Drunken Master'. 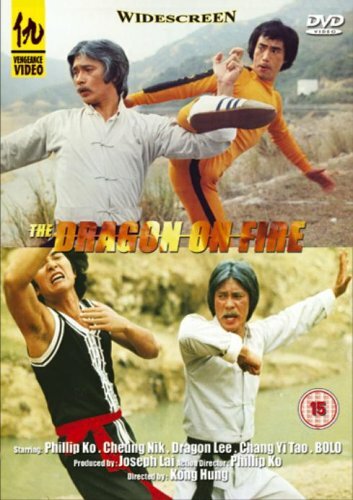 (8) Tiger Yeung Cheng Wu and Lee Hoi San played the penultimate bad-guys in the inadvertent 'Game of Death' sequel, 'Tower of Death'. Now where was I? Oh, yeah! I know. 'Enter The Three Dragons'. A film so terribly scripted; half-way through it I wanted to finish my laundry (and that's not a euphemism). OK, I have to admit, there were a couple of things about this piece I didn't mind watching. For a start, I thought Dragon Lee, Lee Hoi San, and Bolo, all showed a lot of promise fighting on camera, without seeming too dry compared to the rest of the cast. Moreover, I got a right kick out of some of the 'westernised' incidental music, plus it also would have been nice to see a bit more of Bruce Thai in combat. But as for the rest of this movie on the other hand? No. Afraid not. Mainly because the overall story was so jumbled to digest, I didn't know what in hell was going on from one moment to the next. It started off with Sammy getting knocked out and the diamonds getting stolen from him. Then there was some confusion in recruiting the appropriate Dragon for the adventure. Next there was something going on with 'Bruce' in a field. After that, most of the cast beat each other up for no apparent reason. Then gang-bosses double-crossing each other. Monks. A sister getting kidnapped. Excreta. Excreta. Excreta. Plus whatever else this film wanted to convey. Boy-oh-boy! It's a shame really. 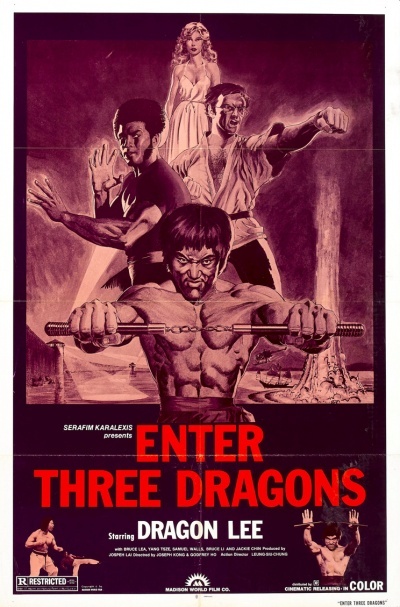 I'm sure 'Enter the Three Dragons' could have been a lot better if it was more focused. Some of the fight scenes were quite nifty -- yet long -- to gaze at. And I bet my bottom dollar that the dubbing artists were having a right laugh at the audience expense, by not presenting on screen what was really going on. Oh Bugger! Let's hope my next Hong Kong offering is better than this one.